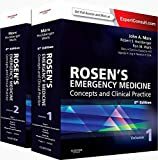 Rosen's emergency medicine : concepts and clinical practice. Volume 2 / editor-in-chief, John A. Marx ; senior editors, Robert S. Hockberger, Ron M. Walls ; editors, Michelle H. Biros ... [et al.]. Sect. 7: The developmentally or physically disabled patient -- Sect. 8: The problem patient -- Pt. VI: Emergency medical services -- Pt. VII: The practice of emergency medicine -- Bonus online content -- Youth, violence, and street gangs -- Medical literature and evidence-based medicine -- Multiculturalism and care delivery -- Bioethics -- End of life -- Emergency medical treatment and active labor act and medicolegal issues -- Wellness, stress, and the impaired physician.